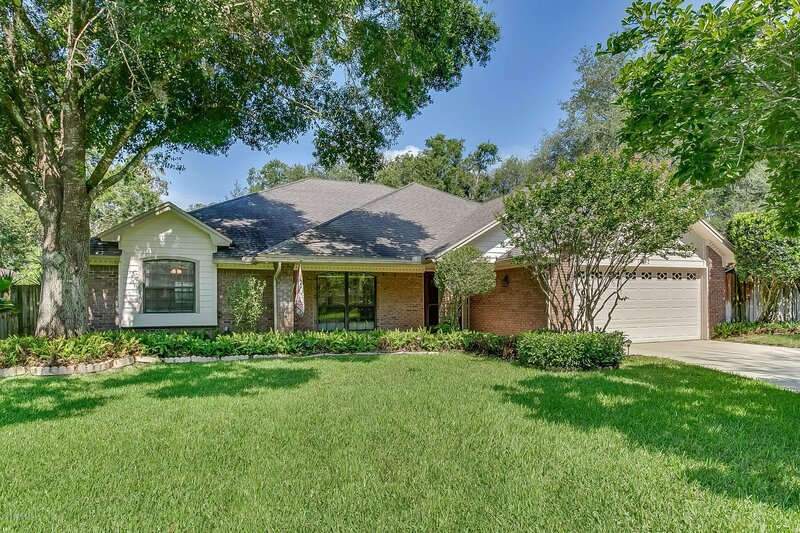 Enjoy the canopy of oaks in this wonderful Mandarin community! Welcome home to this 3br/2ba plus den/study, located on quiet cul-de-sac street. This full brick home features lush landscaping, and fully fenced rear with sparkling in-ground pool. Inside you'll find a large great room with corner wood burning fireplace, formal dining room just off the kitchen. Kitchen features tile floors, granite counters, breakfast nook and large walk-in pantry. Split bedroom arrangement. Spacious secondary bedrooms, den/study with French doors and new wood flooring. Guest bath with stain glassed window. Master suite features walk-in closet with custom built-ins, spacious master suite and garden tub, shower and separate water closet! All new subway tiled shower w/ built in corner seat. Enjoy the screened enclosed lanai that overlooks the sparkling in-ground pool. Fully fenced back yard with plenty of space for play too! Laundry room complete with built in cabinets and washer and dryer stay! Spacious 2 car garage, with enclosed area that would make a great wood working shop or just extra storage. Pull down attic stairs. Enjoy the front porch, great place for rockers! Screened enclosed patio features ceiling fan and tile flooring. New carpet and paint! All of this located in highly desirable Mandarin community! Low HOA, and no CDD. Close to major shopping, I295 and I95! Listing courtesy of RE/MAX SPECIALISTS. Selling Office: BETTER HOMES & GARDENS REAL ESTATE LIFESTYLES REALTY.